Description: Individually numbered limited edition! Only 2500 copies! 180-gram audiophile LP pressed at RTI! Cut from the original analog mono master tapes by Kevin Gray and Robert Pincus! 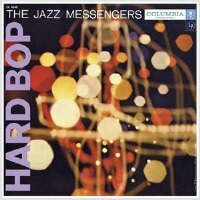 Some of the greatest jazz musicians of all time have passed through Art Blakey's Jazz Messengers: Horace Silver, Hank Mobley, Kenny Dorham, Wayne Shorter and Donald Byrd, among many others. However brief their stay, working with the demanding and full-throttle drummer not only increased their visibility, but also their chops and interpretive capacity. Blakey's ability to drum up the best players in the game may have even eclipsed his superhuman ability to play drums. Altoist Jackie McLean, trumpeter Bill Hardman, bassist Spanky deBrest, and pianist Sam Dockery deliver whole-bop goodness on five propulsive, fiery tracks. True to its title, this LP bops hard, with a ferocious swing, boundless energy and telepathic communication between players -- especially Blakey and Hardman. Considering the rhythmic demands of Blakey's locomotive playing style, this was an incredible achievement. You hear all the vivacious interplay that occured when Blakey and crew forged a bold new vision of muscular, funky jazz. This is music that still resonates over 50 years later. Not to be missed! Recorded December 12 and 13, 1956 at Colombia 30th Street Studio, New York City. Originally released by Columbia as CL 1040. Mono.